Add the custom touch to the front/rear of your car! Be the first with the new appearance. Bendable to fit most applications! Other brands sells for over $50 or even over $100 for same or lower quality. Your search is over. It's time to get the better look. Always in stock and shipped within 24-48 hours. All orders before 3 PM eastern time are usually shipped on the same day. Shipping may take 2 to 5 business days within continental US via USPS. International inquiry is welcome. Shipping is 8.25 anywhere in USA. Please contact us if you need a different measurement. Please include your model & year. You'll be happy with the new appearance of your car. Satisfaction is yours. Guaranteed. "Thanks for the mesh. My car looks better now. My wife and I love it." "Almost spent double for another brand. 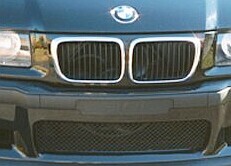 Glad that I got the mesh grill installed this morning. It looks yummy. Thanks"
Edward Downey, West Des Moine, IA. "I am amazed with the difference it makes by just adding a mesh. I installed it all over my car now. They look nice. Thx"
Sriram Thodla, Ajax, Ontario Canada.